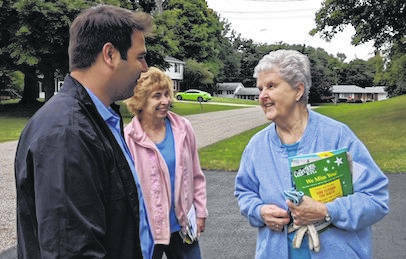 Democratic Congressional candidate Danny O’Connor was knocking on doors Saturday at Hickory Lane in Mount Gilead when he ran into Laurie Young and Pat Nesbitt returning from their mailbox. MOUNT GILEAD — Morrow County was one of seven counties where 12th District Congressional candidate Danny O’Connor knocked on doors Saturday. He stopped on Hickory Lane in Mount Gilead as Laurie Young and Pat Nesbitt were returning from their mailbox. After introducing himself he listened to their ideas and suggestions. O’Connor, who is a Democrat, said he plans to reach across the aisle to Republicans to get something accomplished. “I believe I can work with Republicans. You know I’m marrying a Republican. My fiancé is a Republican, but she calls herself a ‘Dannycrat,’” O’Connor said. O’Connor told about his experience stopping by for lunch in Waldo for a bologna sandwich where he talked with a man who had just retired. The man said his prescription medication price had tripled this year. It seems that the pharmaceutical companies were selling and reselling the medication to other companies, which made the price go up. O’Connor is optimistic about the Nov. 6 election, but knows he has a lot of campaign work to do in the meantime. He lost by 1,680 votes in the August special election. O’Connor visited the Morrow County Democratic headquarters in downtown Mount Gilead. The campaign office, 9 W. High St., Mt. Gilead, is open Monday through Thursday, 2-7 p.m. and Saturday noon to 5 p.m.. Call Chairperson Susan Grundy for extended office hours at 419 -768-1110.